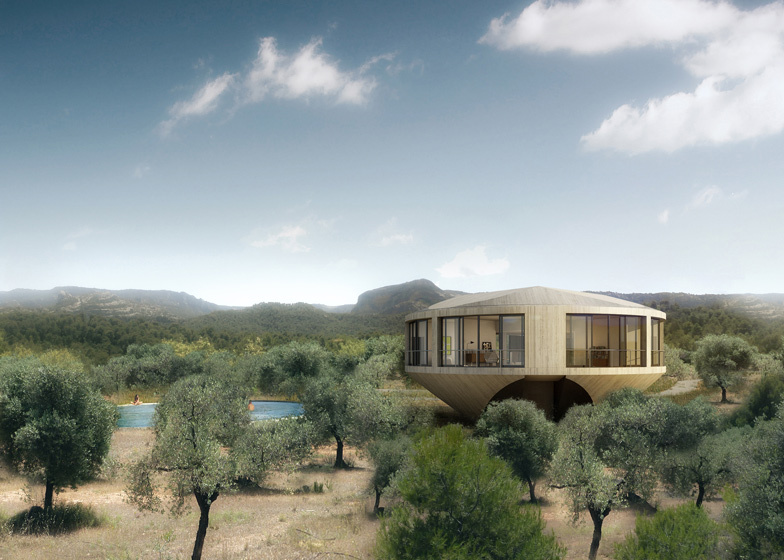 American firm Johnston Marklee has designed a circular house with a paddling pool on the roof as part of a series of inventive holiday homes proposed by architects including Sou Fujimoto and Didier Faustino for a national park in Spain (+ slideshow). Johnston Marklee's Round House is number four in the series of Solo Houses, an initiative funded by French developer Christian Bourdais that gives 12 architects free rein to develop any design within a set budget. 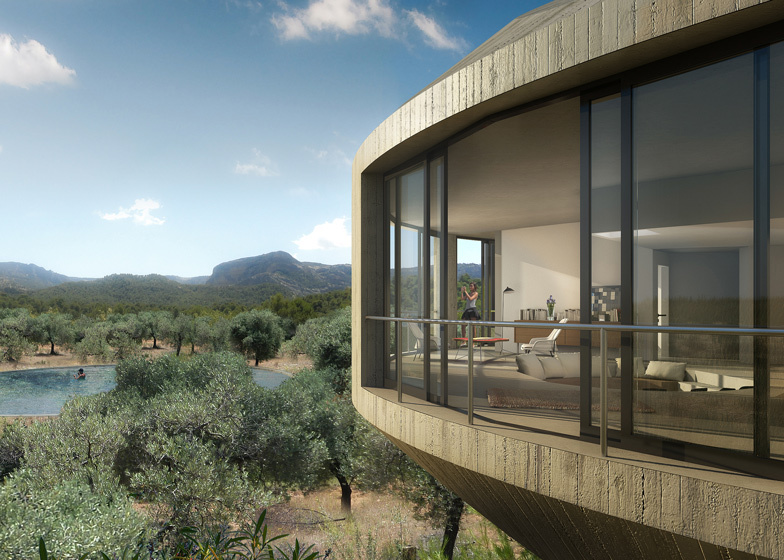 Rising above an almond grove, the house will accommodate living spaces and bedrooms on a elevated circular floor. Bedrooms will be positioned around the curved edges of the building, while sliding glass screens will allow rooms to open out to one another. 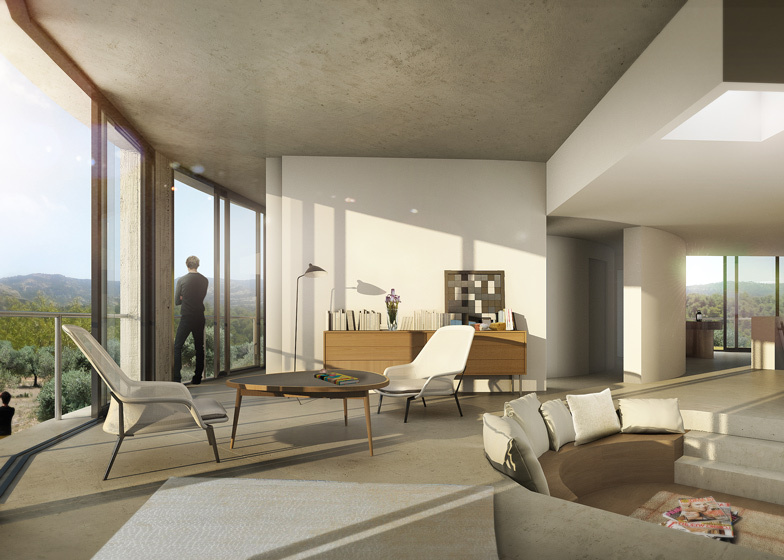 A spiral staircase at the centre of the house will lead residents up to the rooftop deck, offering panoramic views across the rural landscape. Architects Sharon Johnston and Mark Lee compare the building to a string of famous villas with rotundas, including Andrea Palladio's Villa Rotunda and Buckminster Fuller's Dymaxion House. "[It] captures the continuous horizon line of the surrounding landscape while accentuating the different spatial characteristics of the site's orientations," they said. Both the base and roof terrace will feature a small square plan, contrasting with the curved outline of the main building's floor. Round House is one of 12 houses set to be built as part of the Solo Houses series. The symmetrical concrete Casa Pezo by Chilean studio Pezo Von Ellrichshausen is the only project completed so far, but will be followed by Didier Faustino's Big Bang-inspired structure and Sou Fujimoto's Geometric Forest. Situated on the outskirts of Cretas, Spain the Round House follows the grand tradition of country villas sited within an idyllic landscape. Approached along the edge of a dense forest and the Parc Natural dels Ports beyond, the Round House emerges as a singular object amongst a grove of almond trees. The house consists of a single floor elevated above the almond grove to capture a panoramic view of the surroundings. The circular floor plan is supposed by a smaller base with a square plan, creating a sense of detachment from the landscape whilst remaining grounded by its inherent weight and mass. Protruding from the base is the main entrance. Upon entry the visitor ascends a flight of stairs and arrives within the centre of the house. The primary axis of the bilaterally symmetrical plan runs along the length of the entry stairway, and is shaped by two curving walls that connect the living and dining areas of the open plan. These walls create a compressed spatial sensation while directing the visitor outward towards the panoramic view at the perimeter. Hovering above the almond trees, the space of the open plan extends into the landscape. Behind the curving walls are four bedrooms with bathrooms and storage. The sliding doors of the bedrooms can open to connect to the living space and form a complete open plan when desired. A spiral staircase allows visitors to access the roof deck which has a square plan identical to the base of the house. 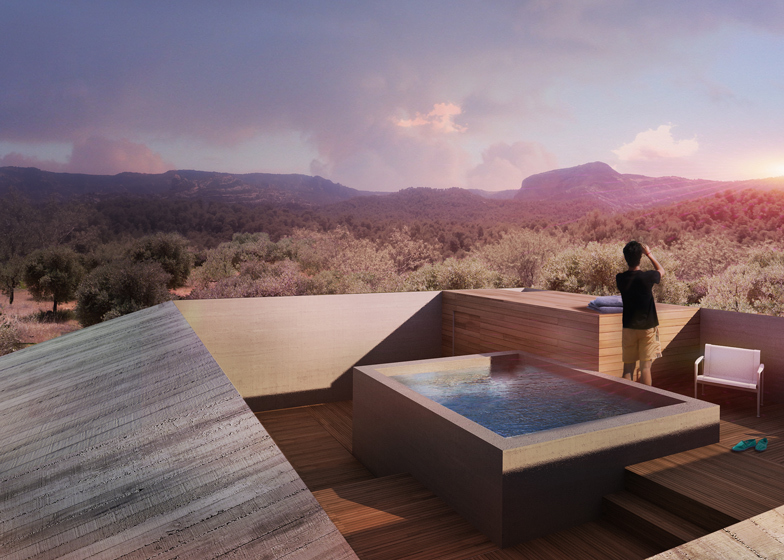 Centred with a pool, the roof deck obtains an unbroken 360 degree view of the Aragonais backcountry. Following the lineage of Andrea Palladio's Villa Rotunda, Buckminster Fuller's Dymaxion House, and John Lautner's Chemosphere House; Johnston Marklee's Round House captures the continuous horizon line of the surrounding landscape while accentuating the different spatial characteristics of the site's orientations.